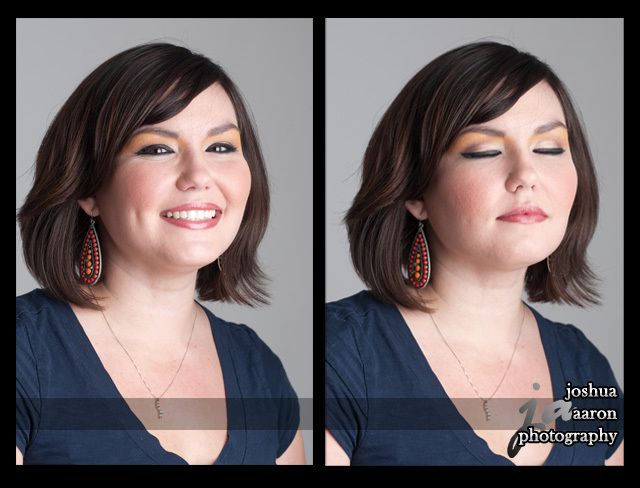 And we are back for part two of our make-up experiment with the fabulous Jamie Floyd. I wish I could hire her everyday to doll me up, but alas. If you haven't already taken a look at part 1 of this post, you can catch up here . One other note before you go any further. If I had known I would look this bad for Don't #2, I would have hired a model. Don't judge just learn! Here I am wearing heavy eyeliner. Not only is it heavy but it was applied (at great pains to Jamie) without precision. The funny thing is, bridal makeup does not simply mean to add more. Refinement is the name of the game. Another part of this don't is the obvious loud gold color all the way up to my eyebrow. Just don’t do it. It is ok to wear gold, in moderation. Now granted everyone is different, this is just an example that such a loud color may not be a good selection to have in your makeup bag the day of the wedding. Make sure to blend your eye makeup. Blending is the key to insuring your makeup looks awesome. DO GO GLAM! It’s your big day and you know what they say. Go big or go home. For this makeup look, we have foundation with blush and powder followed by a purple smoky eye, black liner, and corner lashes.